When November began and I learned that it was the beginning of National Novel Writing Month, I thought that this would be a good month to work on my Great American Novel. Wannabe writers are encouraged to write a novel in the space of the month. Not necessarily a good or even a salable novel, but just a story of sufficient length to be called a novel (NaNoWriMo uses 50,000 words as a marker, which John Scalzi says is actually slightly short for modern novels — "60k is usually the lower bound". Unfortunately Moose and Squirrel have kept me very busy. When I get home my mom usually hands Boris to me so that she can return home. (Natasha usually only wants to be with mommy.) I've hardly written 500 words let alone 50,000. I did finally get around to drilling the holes in the secretary desk so that the computer fits in it nicer with the cords hidden neatly. That one had been on my TODO list for months. At first I just wasn't sure where the holes should go. After some time I decided that I could achieve what I wanted with only three holes, two on the inside part of the desk so that they would not be noticeable should we ever decide to relocate the desk in such a way as anyone could see the back. The other day our dryer started making this noise. Actually, it made it a week or two ago but it was a one time thing so I didn't give it much head. Alas the noise came back and it wouldn't go away. I consulted Google and YouTube and found that video. 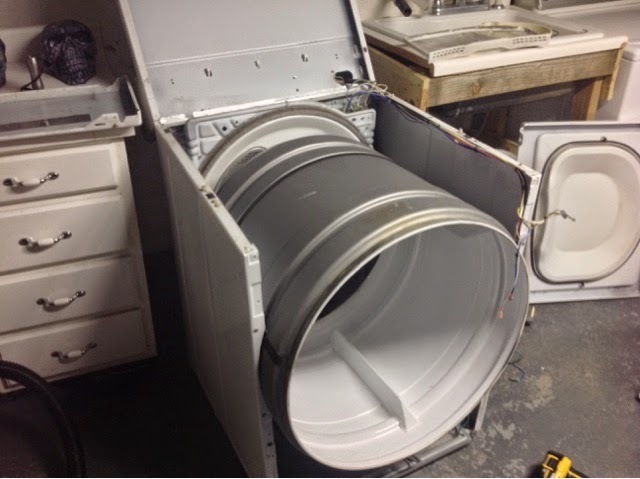 The challenge has been finding the time to take apart the dryer and troubleshoot. As I said, when I get home, I'm usually handed a fussy kid who won't go down for a nap and my evening is consumed. Yesterday I was finally able to take the machine apart and lubricate the drum barrel. Unfortunately, to know if this works, I have to re-assemble and test. Very time consuming. It was a good day for the Chicago Catholic Church today. Any day that calls us to imagine...hope... and love is a great day...isn't it? Tonight I feel a sense of excitement and hope. I am reminded that love drives the fear out of the "messiness" of life. I am convinced that when we respond to situations, challenges and crisis out of fear, we almost always make the wrong decision. Fear makes us timid when we should be bold. Fear makes us lash out when we should listen. even when we are afraid. God doesn't let us drown in doubt. God gets in the boat with us. A ship in a safe harbor is safe, but that's not what ships are built for. God calls us to set sail and live boldly! Good advice and I think Nightingale and I need to invoke the No Decisions from Fear thing more.